Friday night: Mostly clear. Few clouds late. 50s to low 60s. Saturday: Partly sunny. Low to mid 80s. Sunday: Warm and more humid. Hazy (and smoky) skies. Low to mid 80s. Smoke from wildfires in the Western United States gave us a hazy start to the day, but the sky will turn bluer with time as it slides out. 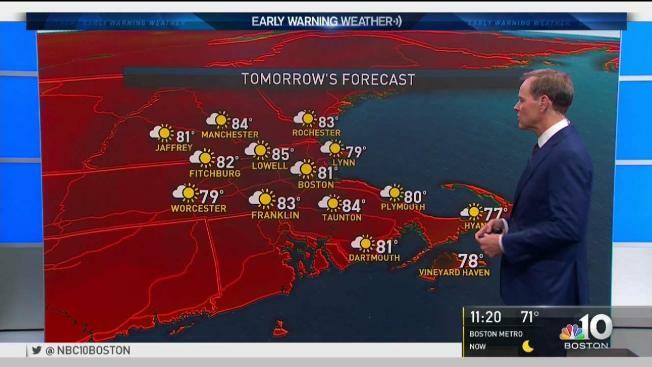 With lots of sunshine, highs will pop into the 80s across New England. Humidity will be low and comfortable. Humidity is still pleasant on Saturday, with highs again in the 80s for many. Sunshine will be abundant, so the beaches will be busy. A slight sea breeze will keep highs there in the upper 70s to near 80. It turns muggier by Sunday, with highs again in the 80s for most. A decaying front may spark a pop-up storm in far Northern and Western New England, but the vast majority of places will be bright and dry. A big ridge, or area of high pressure, builds across the East Coast early next week. That allows temperatures to spike into the 90s to start the week, with oppressive humidity returning. Temperatures should return closer to average, in the upper 70s to near 80, as we then work towards Labor Day Weekend.